Remember to use all your HSA dollars in December! In less than one month you’ll be celebrating the New Year and you will be celebrating a little more knowing you didn’t allow your 2016 Health Savings Account dollars to evaporate. 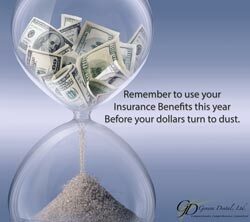 Remember to use up your accumulated HSA insurance account; those hard-earned dollars do not rollover like the minutes in your cellular plan. Call us today to make an appointment or get more details.